If you're only just dipping your toe into the exciting world of organic beauty, Evolve are a great company to start experimenting with. 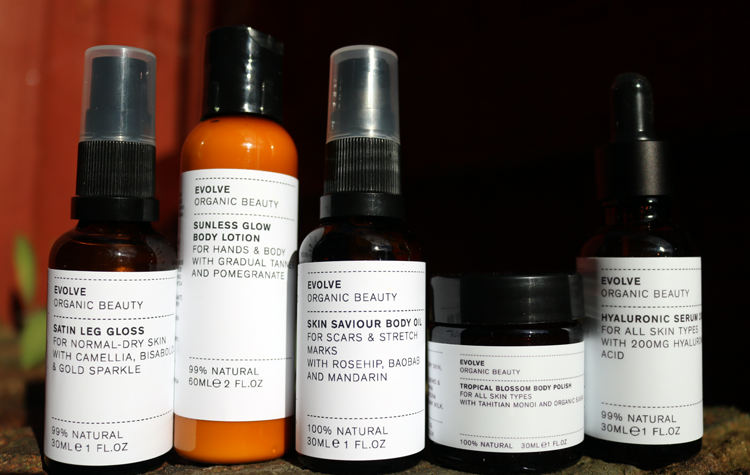 Based in Hertfordshire, Evolve Organic Beauty pride themselves on being an artisan brand who carefully hand-craft all of their products and use some amazing superfood ingredients. Their formulas are innovative, yet they use only the very best natural and organic oils and butters, with absolutely no 'nasties'. Everything is also vegan and cruelty-free, so lots of people can enjoy using them. I was kindly sent a package of travel size products to test out as I'm fairly new to the brand, and haven't tried much from them in the past. For supermodel style pins, a quick spritz of this Satin Leg Gloss is all you need to add a healthy glow and shine to your legs, whilst moisturising them at the same time. Full of Organic Camelia Seed Oil, Bisabolol, Organic Castor Oil and a sprinkle of Mineral mica and titanium, this dry oil looks great on top of a tan and the shine that it delivers uses clever light trickery to give the illusion of slimmer legs. What's not to love?! 100% natural & 96.6% organic. Gradual tanners can be sometimes difficult to find in the green beauty world, but there are a handful that do exist, and Evolve's Sunless Glow Body Lotion is one of the best and easiest to use. It's very moisturising thanks to the likes of Shea Butter, and there's also Organic Aloe Vera to soothe away any redness or irritation (so it's ideal to use after shaving!). Like all gradual tanners, it does take a few applications to start to see a tan forming, hence the name, so stick with it and enjoy a natural looking colour in a matter of days. 99% natural & 86% organic. I'm a big fan of using Rosehip Oil on blemish marks and old acne scars, so this Skin Saviour Body Oil was a definite winner for me. In addition to the Organic Rosehip Oil, there's also Organic Baobab Oil (to nourish and repair), and Mandarin Essential Oil (high in Vitamin C to lighten dark marks) which makes it a very effective formula for stretch marks and scars. 100% natural & 99.6% organic. Since arriving back in England, I've had a major case of the holiday blues, but this deliciously summery scented body scrub is giving me a helping hand in recovering! It smells amazing as the sugar-meets-oil scrub is infused with the gorgeous scents of Monoi and Gardenia. Leaves my skin super soft and revitalised afterwards. 100% natural & 93.3% organic. Hyaluronic Acid is a true superstar ingredient that everyone can benefit from adding to their skincare routine, so if you haven't tried it before, this Hyaluronic Serum is the perfect product for beginners and skincare junkies alike. It absorbs instantly into the skin and gave me an immediate noticeable difference as my skin was much more plumped up and smoothed out after just one use. Although dry skin will drink this up, I feel that it's suitable for all types as it helps to hydrate the skin 'from within', so it doesn't overload it on the top like a thick or heavy moisturiser might do. A great serum to invest in for protecting your skin against the cold and drying elements of Autumn/Winter. 99.3% natural & 24% organic. 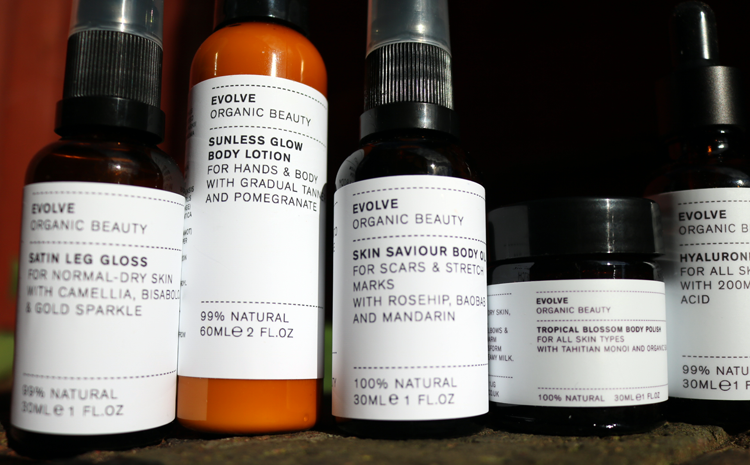 Have you tried anything from Evolve Organic Beauty?